There are quite a few improvements I have noticed that could be made to custom blocks. Please read entire post, especially if you are skeptical about it. *NOTICE: Some of these are in other topics, but I feel I should mention them here as well. return 20; //This tells you what "getWaffles()" is equal to. So if I were to say x = getWaffles(); x would either be equal to 20 or 0. So obviously there would need to be some way to return a value. So how this would work is that when a custom reporter was used in a block, it would run the code and find the return / report value. If there was none, it would report the value at the bottom. These are obviously the same as custom reporter blocks, but are booleans. A function this could be used for is making a “is a multiple of” block or something similar. They could be used to say “string contains other string” and other functions that are too simple to be made into a full-fledged block, but good enough to make custom. These would be variables that were completely local to the block. No other part of the program could use them. How would these work? This is the first one. But how would this work? Somewhere there would have to be something like a “create local variable” button. Obviously, a “create variable” block wouldn't work so well, because that would make it possible to lag out scratch. However, the idea of getting the set, change, etc. blocks by right clicking and pushing “get block…” is plausible. I think this is the better solution. How it would work is similar to custom blocks. Only the blocks inside of the C-Block could use the variables. The weird looking variables and lists that look like “+” are just a quick sketch of how the using block could create more than one variable. However, I think it should only be able to hold either variables or lists. I think that maybe these should also have different colors, and they should use the right-click functions to get the other blocks. There are a few problems with implementing these features. a) New Scratchers might find them difficult - this is true. When I started doing real line-by-line coding, I found it hard to understand WHY a return value was needed. This was because I was calling the things as functions and not as values - so maybe it would make more sense here. b) Hard to implement - this is the worst problem. Because they would be hard to use for new scratchers, it is not on the scratch team's list. Also, for custom variables, there would probably have to be a block editor. Otherwise, when would the variables you needed show? When you clicked on the script you were editing? Who knows? c) Most of these features are already in BYOB, so you can just use that. a) This would allow people to make much more organized projects, make blocks that other scratchers could use to perform well-made functions, and make scripts much easier. b) This would be a good way to learn about more advanced programming topics. c) Even if they are in BYOB, it is much more advanced than Scratch, so this would make it easier for more people to learn about this kind of thing. Support all! All are used in real coding; why not here? My dank userscript|Check out my Github, too! Kumquats, this signature is inedible and poisonus. Also try the code below in IBNIZ. Does that mean you support? I like the Local Variables and have come across a few times when I could have used them. I'm sorta on the fence about this because it would be confusing for new scratchers. I support this suggestion as well. I think the highest priority is the return value. (boolean is sort of a special case of return value). Function local variables would certainly be useful but the I worry that the implementation would add more confusion for beginning programmers. 12 supporters! Can we get more? 2. 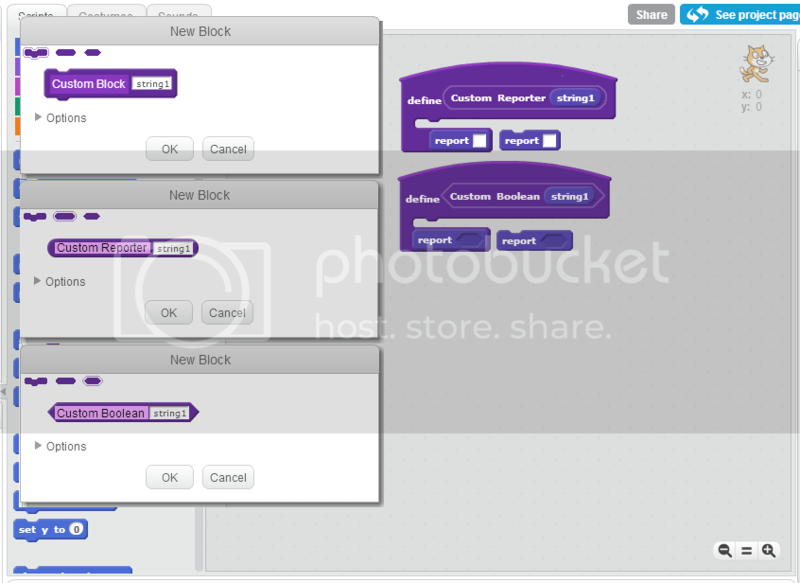 (1) takes care of this with other blocks already in Scratch. 3. I support local variables in principle, but do not see a way to add this to Scratch that is easy enough. Good mock-up art! I wondered how it would be good to implement making new return blocks. Thank you for this thread and your ideas! I have been thinking about how to simplify this. From my mock-up, get rid of the Make a Reporter button and New Reporter dialog box. 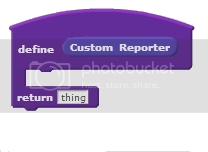 If “Return value” is checked, the outline of the block becomes a reporter (capsule shaped) both in the dialog box and the define block (and after it is made). The other change is to the define block. Like in the mock-up, it is a wrap block. And the blue return value cap block is affixed to it. But the C (wrap) is collapsed so the return cap block is connected, at start, to the top tab of the define block. Since the return block is connected like a normal stack block, it is obvious to Scratchers they can add new blocks in between. Since the return block is connected like a normal stack block, it is obvious the definition returns whatever value is in the return cap block, if no other changes are made. 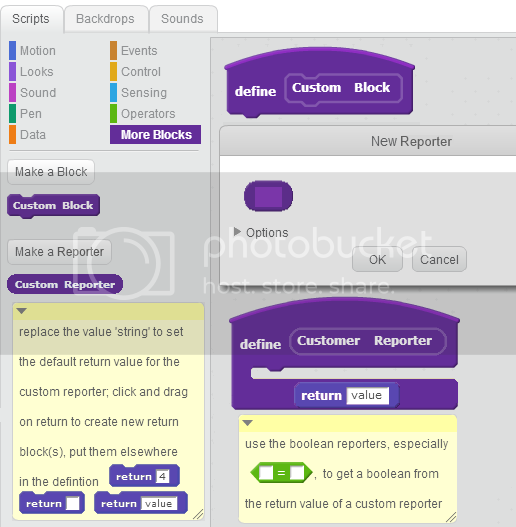 As in the mock-up, the return value cap block can be clicked-and-dragged from the define block to create new cap blocks to use elsewhere in the definition (like blue reporter blocks in Scratch block definitions). When I get a chance, I'll create new mock-up art.